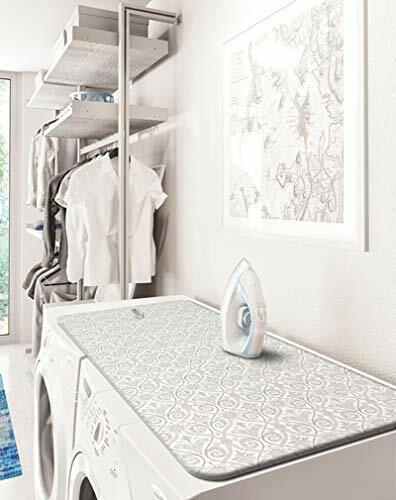 The Ironing Mat is the perfect alternative to those bulky, heavy, full size ironing boards. 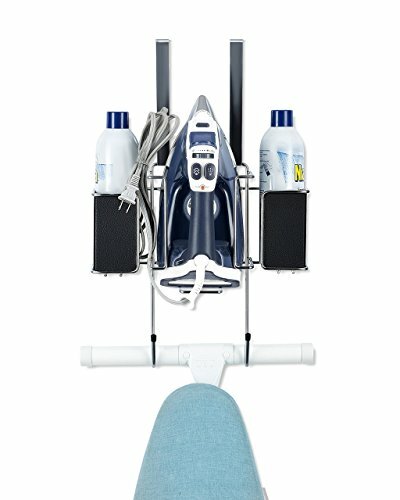 Whether you just need a quick, small ironing job or you simply don't want to have to haul out a large ironing board, the Ironing Mat is the ideal solution. 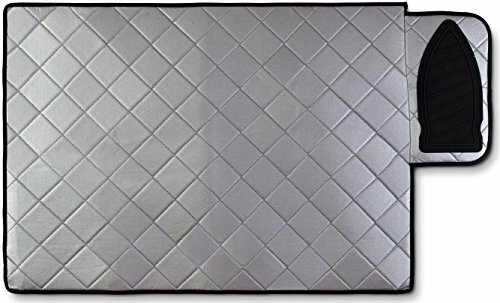 This 100% cotton, heat and scorch resistant mat is all you need. Simply spread out the mat and instantly change any flat surface into an ironing board. The magnetic edges will allow you to securely place the mat on top of the washing machine. It provides a wider area than the typical narrow full size ironing board as well, so you can work more efficiently. The Ironing Mat features a double sided silicone iron rest to safely place your hot iron while you're working. This area has a raised surface for slip resistant protection. And, the elevated texture also helps the iron to cool down faster when you're finished. The Ironing Mat is lightweight and it folds easily and compactly, so you can conveniently store it nearly anywhere. 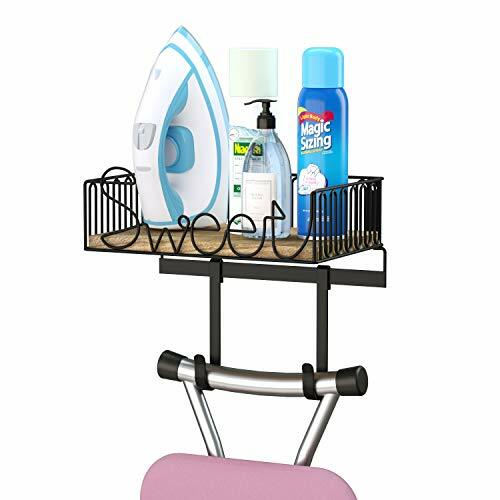 Great for traveling, dorm rooms, small apartments or anywhere space is limited. The Ironing Mat measures 19.5 inches X 28 inches. QUICK CONVENIENCE: Simply unfold the mat and change any flat surface into an instant ironing board. STORES EASILY: Folds simply and compactly so you can store it even where space is limited. INCLUDES SILICONE IRON REST: Features a double sided slip resistant textured silicone area to safely place your hot iron while you're working. COMPACT AND LIGHTWEIGHT: Store folded in any small space. Easy to take along when traveling. PRODUCT DIMENSIONS: The Ironing Mat measures 19.5 x 28 inches; wider and easier than the standard narrow ironing board. 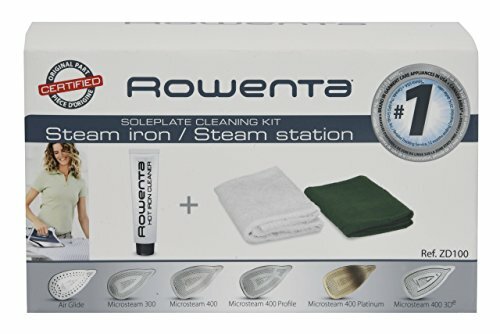 The rowenta zd100 soleplate cleaning kit contains a specially formulated cream that cleans soleplates by removing the draggy coating caused by excess starch, detergent build up and burned on synthetics. It is also ideal at removing melted webs, fusibles, iron on interfacings and trims. The cleaning kit is appropriate on all types of soleplates. Kit contains: 1-ounce tube of soleplate cleaner; application cloth; polishing /finishing cloth and set of instructions. Great organizer for your iron, ironing board, water mister, fabric sprays, starch, wrinkle releaser and stain sticks. Great use of limited space in laundry / utility room or hang over the door. The over the Door hooks fit regular door up to 1-3/4 thick. Support BOTH Over the Door and Wall-Mounted hanging methods. Hardwares screws are included. No more wondering where to store your ironing board. Organize laundry items such as hand irons, detergent, stain remover and more in the storage basket. Hang an ironing board for easy access. 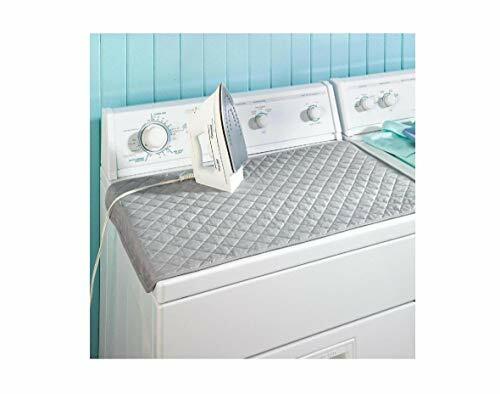 Iron Anywhere Weighted Mat 18inch x 31inch weighted corners for easy ironing compact and easy to Store works on any surface ideal for Apartments and Travel 100 percent cotton The Ironing Mat conveniently folds for easy storage. Iron anywhere without an ironing board, with the Ironing Mat! This handy, heat-resistant ironing mat is ideal for quick pressing or touch ups. 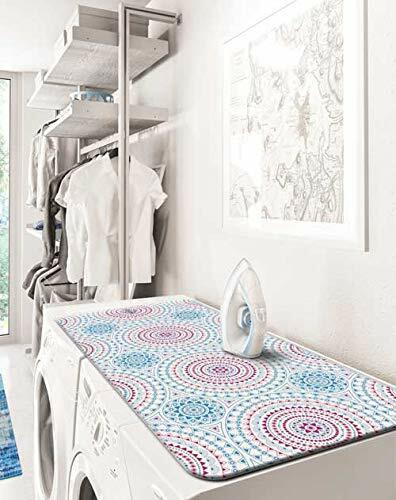 Simply place on any stable surface, the perfect ironing board alternative. Make your life more easily, spend more time doing things in life you enjoy! 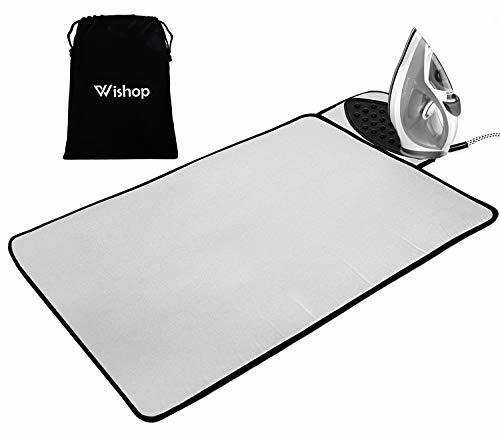 GOOD NEWS... Why choice WISHOP Ironing Mat? The heat resistant silicone hot iron pad to convenient rest your iron flat on the iron rest when ironing. Raised bumps on the surface allow for better air circulation. The ironing blanket can be quickly folded for easy storage. Simply spread out the mat and instantly change any flat surface into an ironing board. Features a double sided slip resistant textured silicone area to safely place your hot iron while you're working. Fabric: 100%Cotton ironing mat, heat resistand silicone pad and 100% polyester drawstring bag. Order as a Special Gift for Your Friend or for Yourself Today. We want you to be satisfied with our products, so you can buy with confidence! STORES EASILY: Folds simply and compactly, you can store it even where space is limited. The ironing mat conveniently folds just about 14.5" x 11.5" inches for quick and easy storage in drawstring bag. MATERIAL: Cotton with silicone coating, fibre pad for soft and heat reisitant silicone pad. Fabric is washable so lasts for long time. Hand wash in cold water. The silicone coating surface has good heat resistance and good stability, which helps to reflect the heat. Make your ironing faster and save time. SIZE: Ironing Mat: 50.8x72cm (20x28.5) for use on Table, Counter Top and Bed. Fold size: 14.5x11.5 inches. Easily foldable for storage. The width is almost double of most Ironing Boards, so this allows convenient ironing of Garments like Shirts, Dresses & Pants. GUARANTEE: Purchase with confidence as our products come with 2 year warranty. If for any question you are unhappy with our products please contact us. An immaculately ironed shirt, especially with perfect symmetrical, laser-straight creases is a thing of beauty. For formal wear, business meetings or special occasions, you want your shirt to look like it was pressed by a professional. Nothing stands out more than badly creased sleeves with blurred, wavy lines that break in the middle, or the ultimate failure- tram lines that can be seen from across a room. Simply remove Perfect Sleeve from the handy magnetic clip holder, slide it into your sleeve and let go! It will spring out to push your sleeve into the perfect shape and leave you hands free to iron away. Perfect sleeves in seconds, every time! The All-New Perfect Sleeve makes Ironing easy. Get Perfect Sleeves every time, quickly and easily. You can cut ironing time in half. Perfect for sleeves of shirts, blouses and sweaters. It saves you time! Sleeves don't have to be turned over. Suitable for any size (XS to XXXL). Also works for children's pant legs and for most women's pant legs. You'll wonder how you ever lived without it. 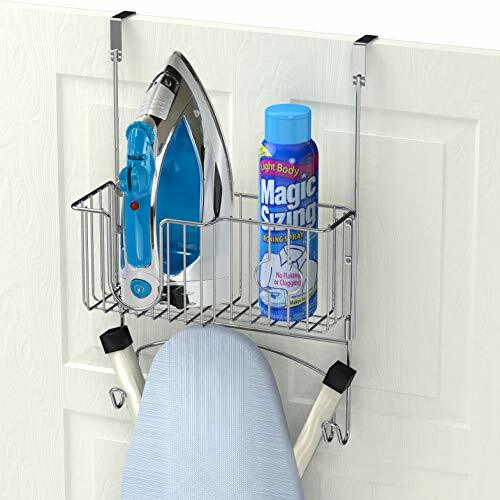 Includes a magnetic mount holder that attaches to virtually any ironing board. Allows for an easy hold on the side of the board and for discrete stowaway under the board when not in use. Perfectly symmetrical, laser-straight creases are withing reach with Perfect Sleeve. Shirts will look like they were pressed by a professional. * Battery capacity: 3.7V 600mAh. * Modes setting: 10 Patterns. * Material: Silicone + ABS. Unique curve hits all the right spots. * Charging time: 2.5 hours One time charge of this wand last for up to 3 hours! The waterproof seal can be used in the shower, bathtub or swimming pool. 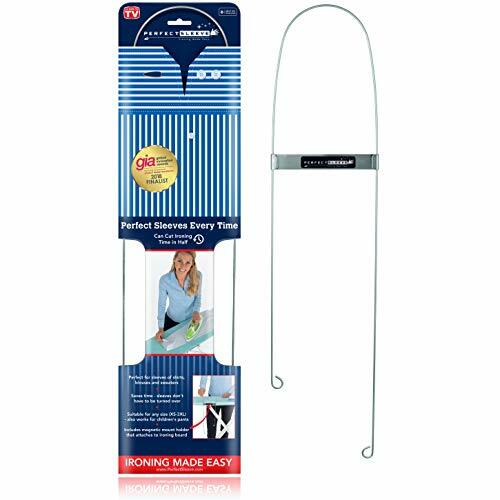 Turn any flat surface or door into an instant ironing station with our new 2 in 1 hanging steamer pad and ironing blanket! Made with extra layers for steam and heat protection enables you to iron on any surface faster and more efficiently. Our specially designed silicone textured base prevent your steamer pad from slipping and sliding as you ironing your clothes. Our Westex Steamer pad is foldable and easy to carry when traveling! Perfect for use within small spaces! Features: Woodworking DIY polishing magic tool! Wood carved DIY first choice!!!!! Application: Suitable for wood, plastic and other soft materials carved. Applied to engraved designs, chamfering, hollow out, grooving, reaming, and so on. Purchase Note: Only suitable for soft material such as cork. And cannot be used for hardwood carvings, such as grinding. 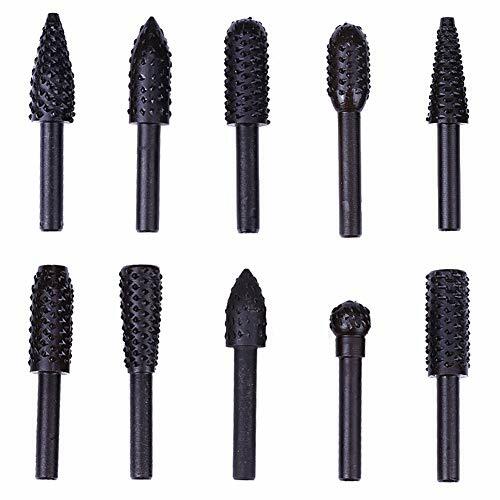 Suitable for wood, plastic and other soft materials carved.